I'm pretty boring when it comes to my footwear selection for gamedays. I'm pretty consistent with orange or white flip flops for the warmer games, and knee high sweater boots or 'ugg' style boots for the colder games. Usually brown. 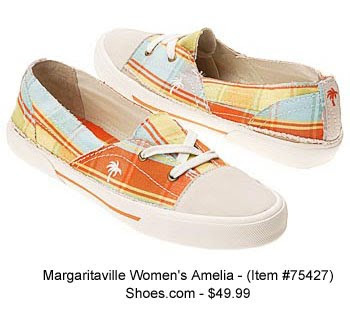 My original idea for this post was "Where to Find Orange Flip Flops", and as I was 'researching' online I kept stumbling across some really funky and fun shoes that I'm not sure I could pull off - but thought they were worth posting here for your fabulous, fashion forward Clemson Girls who might take the risk. I found these two pairs of flip flops while searching for orange flip flops. I like the sheen and shineness to them - makes it more unique than your usual orange flip flops. I love, love the skull and crossbones flip flops - I'm definitely buying a pair. So cute and unexpected. These shoes are probably one of my favorites out of the funky footwear I found online today. I know light blue isn't necessarily a Clemson color, but how cute would these be with khaki shorts or skirt and an orange polo? And the Palmetto Tree makes it all the more relevant. These shoes are pretty wild - but the fact that they were orange AND purple caught my eye. Like I mentioned earlier, I'm not so sure I could pull these off - but these would be a fun way to add to a basic, plain orange or purple dress. 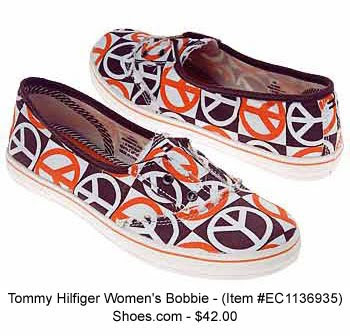 Just slip these on with your jean skirt and orange T-shirt... something fun and different for your gameday outfit. Did I mention comfortable??? I've never been a Crocs kind of girl. I don't mind them on other people, but something about the way they look just keeps me from buying a pair. 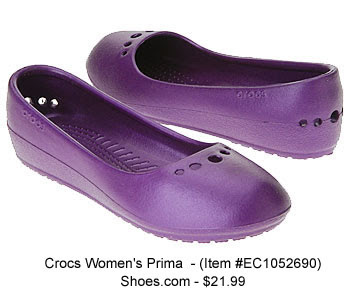 However, I stumbled across this pair of purple Crocs that I actually could see myself wearing. They are styled like ballet flats, but still made of the durable Croc material. So you would look like you're wearing cute flats with your outfit, but still have the comfort and tread of the Croc -- not to mention the holes would be great ventilation for your feet on the hot game days! 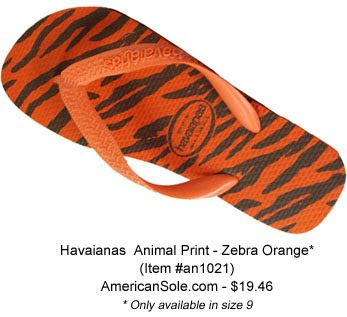 I also came across this perfect pair of orange, tiger-striped flip flops! Ok, well it says 'Zebra Orange', but it looks more Tiger to me, right? These are pretty basic flip flops, but the fact that they look Tiger print makes them perfect for a Clemson sporting event. The only downside? They only come in size 9 on this Web site. You might be able to search by the name of the item and find it online on another site in more sizes...if you do, please post a link in the comments section of this blog. Until then... you size 9 Clemson Girls are the lucky ones who can snag these! So some of us might not be able to pull off the funkier fashions when it comes to gameday footwear, but the little Tiger fans sure can! The funkier and more fun the shoe, the cuter the kids look - so not to leave them out, here are two fun styles for your little Clemson Girls. 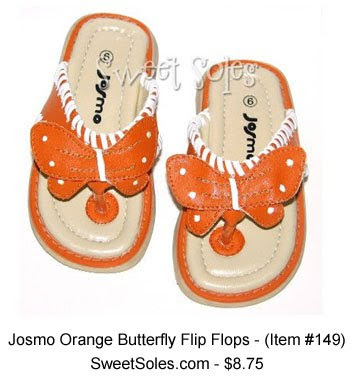 These orange and white butterfly flip flops are too adorable. I really wish they made them in adult sizes - I would buy a pair. :) These would be cute on any toddler Clemson Girl for gameday, and the price is hard to beat. Last, but definitely not least, here are the funkiest footwear of the bunch - and of course they are for the little Tiger Fans. 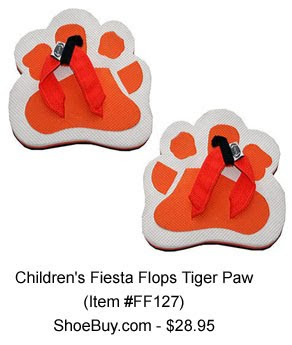 These Tiger Paw flip flops are hilarious - I laughed out loud when I came across these. I can't even picture what they must look like on, but they must be a ton of fun for kids to wear. And surely these must be difficult to walk around in - so put these on your kids for gameday and they will probably be less likely to run off...and if they tried, they wouldn't make it very far in these. If any of you have these for your kids, or buy them, please, please send a picture of what they look like on. So what do you think of these funky gameday footwear? Would you sport any of these shoes to a Clemson game?